$43.639 million on 4046 screens. A surprise spring 2013 hit, The Croods takes us back to the caveman days. We meet the title family, a clan that includes father Grug (voiced by Nicolas Cage), mother Ugga (Catherine Keener), daughter Eep (Emma Stone), son Thunk (Clark Duke) and grandmother Gran (Cloris Leachman). As led by Grug, they live a cautious existence, as he teaches them to fear their dangerous world. Teenaged Eep rebels against these restrictions, though, as she wants to more fully experience the world around her. This trend accelerates when she meets Guy (Ryan Reynolds), a somewhat more advanced dude who tries to prod their evolution. Their location becomes unlivable so the Croods need to find a new home. Grug and Guy clash as they offer different forms of leadership, and this leaves Eep in the middle. We follow the quest for a secure life and the comedic adventures that come along the way. When I went into Croods, I did so with low expectations – really, really low expectations. 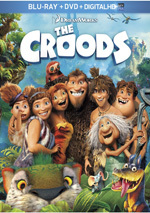 I saw it theatrically but didn’t get around to it until weeks into its run, and even then, I only bothered with it because a friend and I wanted to see a movie and Croods was the only one out there that neither of us had already viewed. Both of us took in Croods as a pleasant surprise. Did it dazzle in any way, shape or form? No, but it gave us a fun little romp with more wit and cleverness than expected. Essentially, Croods acts as a mix of Ice Age, Flintstones and Looney Tunes. This leaves an emphasis on physical comedy, though Croods also comes with some quirky verbal bits as well, so it’s not all comedic mayhem. That balance works nicely and gives the movie a broad feel that suits it. Given the nature of its prehistoric characters, one wouldn’t anticipate scorching verbal wit, but the film makes moments those integrate naturally with the slapstick. These two elements mesh in a satisfying manner without over-emphasis on one or the other. A fine cast helps embellish the material. Cage seems like an odd choice for a role such as this, but he does pretty well in it, as his trademark off-the-wall line readings fit the character surprisingly well. Reynolds manages to tamp down his usual snarkiness to allow Guy to become a viable personality, and Stone adds spark to the traditional teenage girl. Is there anything about Croods that elevates it well above the animated pack? No – I can’t claim that it gives us a particularly inventive film, but not every movie needs to expand the artform. Croods presents a likable comedic adventure that entertains well. The Croods appears in an aspect ratio of approximately 2.35:1 on this Blu-Ray Disc. Expect a fine presentation. No issues with sharpness occurred, as the movie offered crisp and detailed images from start to finish. If any softness marred the presentation, I couldn’t find it. Jagged edges and shimmering remained absent, and no edge enhancement appeared. I also detected no source flaws. Croods provided a palette that featured a broad range of colors. It started with an amber feel but broadened as it went, so the movie offered a nice natural look with lively tones. Blacks came across as deep and rich, while shadows presented good clarity and visibility. This was a very satisfying transfer. I also felt very pleased with the DTS-HD 7.1 soundtrack of Croods. With stomping creatures and all sorts of action sequences, the movie boasted many opportunities to feature all five speakers, and it did so quite well. Various effects elements zoomed around the room to create a fine sense of immersion. The pieces meshed together smoothly and transitioned well. Localization was clean and precise, and the score featured solid stereo imaging. The mix turned into a broad, encompassing piece. When we shift to the set’s extras, we open with a featurette called The Croodaceous Creatures of Croods. In this six-minute, 12-second piece, “Eep” and “Thunk” educate us about nine of the movie’s critters. It’s cute but not especially interesting. Under Belt’s Cave Journal, we get a six-minute, 15-second featurette. Narrated by “Guy”, we get an animated adventure that involves a “Jackrobat”. This provides a mild diversion. Under Croods’ Cuts, we find four “lost scenes”. Including introductions from writers/directors Chris Sanders and Kirk DeMicco, these fill a total of eight minutes, 20 seconds. Three of them come as storyreels, but “It’s a Great Cave” presents final animation. All are good to see but not especially valuable. Across its 35 minutes and 16 seconds, Be An Artist! teaches us how to draw three characters. Supervising animator Sean Sexton leads the piece and covers the methods needed to depict Belt, Macawnivore and Mousephant. Aspiring artists in the audience may enjoy this tutorial. The disc opens with ads for Turbo, Shrek: The Musical and Epic. Sneak Peek also throws in clips for Percy Jackson: Sea of Monsters and a mix of “Holiday Favorites”. World of DreamWorks Animation promotes another batch of flicks, and we get the trailer for Croods as well. A second platter offers a DVD copy of Croods. It provides previews but none of the Blu-ray’s other bonus features. Though it reinvents no wheels, The Croods provides an enjoyable animated adventure. It comes with enough amusement and cleverness to turn into a likable piece. The Blu-ray boasts excellent picture and audio along with a mediocre set of supplements. The lack of substantial bonus features disappoints, but the movie merits a look.